Artisan Magazine is the quarterly digital publication of Natalie Hunfalvay, Leigh-Ann Thomas and Bhavani Konings, who are kind enough to share some of their stories with us. 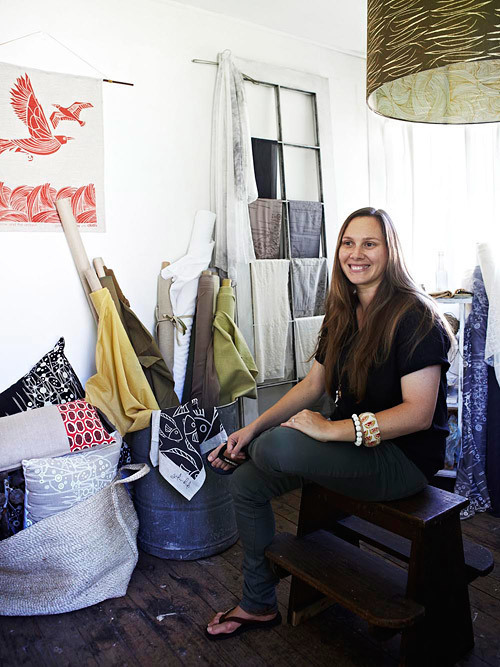 Today they introduce us to textile artist Lucy Simpson (pictured above), the founder of contemporary Aboriginal design business Gaawaa Miyay. 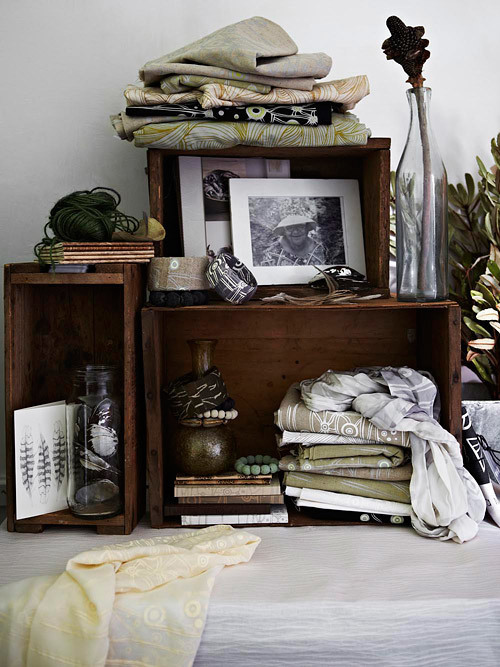 Lucy has generously offered a set of her gorgeous tea towels for one T&W member to win. Full details are below. You can now read Artisan Magazine features via iPad and iPhone! Find out more at www.artisan-magazine.com, or search for "Artisan Magazine" on the App Store via your iPhone or iPad. You can also follow Artisan Magazine on Facebook, on Pinterest or on Instagram @artisanmagazine. When carving out a creative path or career, we often look for a story, idea or a person to guide us and help us fully realize our potential. Some people, by sharing their stories of their creativity and inspiration, can truly change the way we see the world and so allow us to create new stories for ourselves. Meet Lucy Simpson. 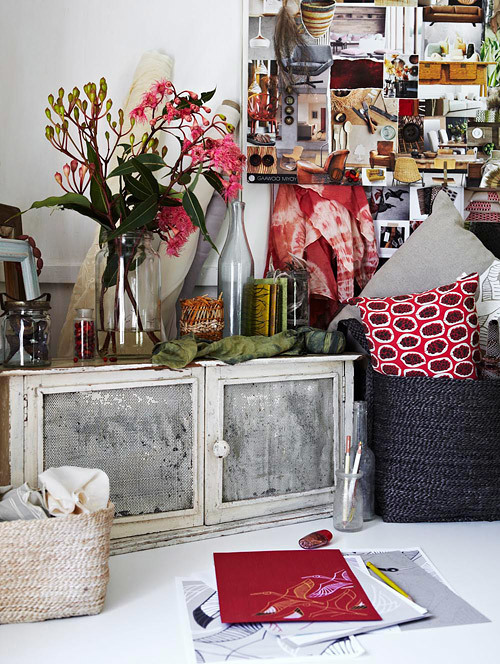 Her textile designs are truly inspirational, as is her passion for her art. 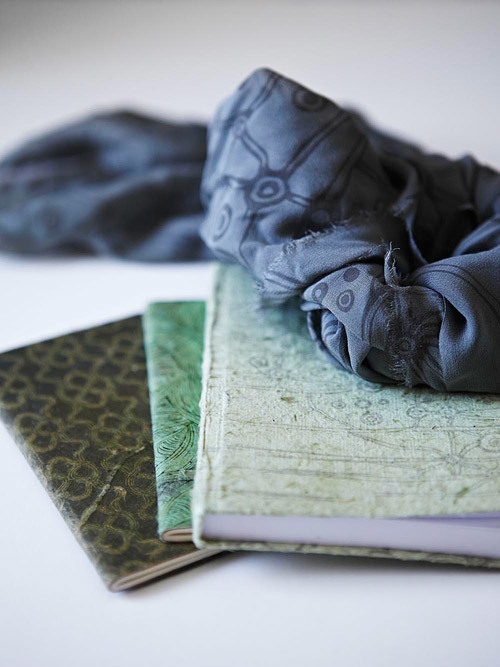 Having met Lucy, a Sydney based textile artist, on a previous photoshoot and after having viewed her gorgeous work, we just had to ask her a few questions about her life and her work. I like to begin my day with an early morning walk around the Cooks River in Marrickville. I find it gives me a perfect start with fresh inspirations, a time to plan out my day and a chance to imagine all the wonderful things I'd like to do. Tell us about your work and what motivates you to do it every day? 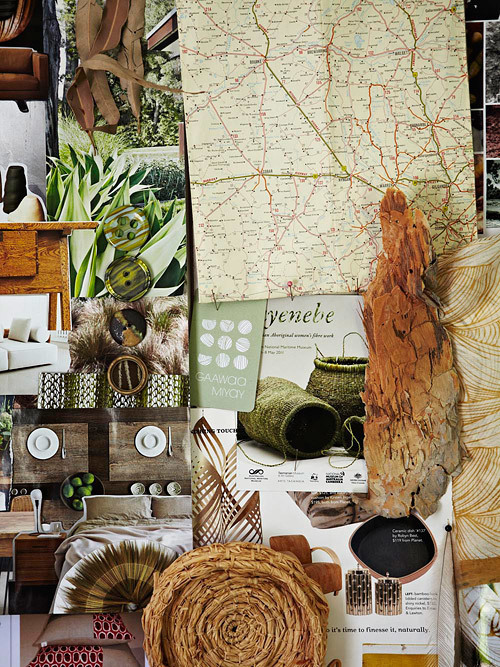 There are a handful of things in life that I love most - they are family, culture and design. I find that through Gaawaa Miyay I am able to create a beautiful balance of all three of these things in a way that makes me truly happy. It was said to me once that if you enjoy your work then it's never really work, and I feel that I get to live that every day. The motivation to create original designs based upon both ancient and new stories is something that means the world to me. I feel it enriches the soul and keeps me forever learning and sharing story, culture and experiences. It also provides me with an amazing opportunity to continue the tradition of visual storytelling – sharing stories and encouraging others to connect to and interact with it in their own way. What helped you decide that this was the right path for you? Since first establishing Gaawaa Miyay in 2008 as my major work at University (a range of four prints for textiles, telling stories of and from my family country and culture), I knew that this was indeed the right path for me. I can still remember the feeling I had when I printed my first length of Gaawaa fabric, and it is a feeling I will never forget.. a feeling of amazement, pride, excitement and wonder – all things that continue to drive me to do what I do, and all still feelings I get whenever I see a new Gaawaa Miyay print for the first time laid out on the printing tables, thinking about the people, stories and memories embedded within that cloth. What challenges and/or barriers did you have to overcome to arrive where you are today? Initially I did struggle with the idea that there would be an assumption that my prints needed to look a certain way to be recognised as Aboriginal design, but as I continued to develop my own graphic style I learnt that artistic expression is just that, and that design can indeed be as varied as the people that create it, and I came to understand that it is the essence of the piece and the story it represents that make the design what it is, rather than its graphic style alone. There have also been aspects of business and managing the many elements that are needed to run a company that have challenged me, but I have found, by seeking advice from industry professionals and business consultants, and family and extended networks, that there is a practical and lateral solution to everything, and that in most instances a lot of people that are willing to share their story, experiences and knowledge to help you on your journey. I have also found that as my experience grows, so too does my ability to manage and run the business. It goes without saying that I am always inspired by experience, family, the landscape, and story in everything I do, but in terms of visual inspiration, there are so many things that inspire me on a daily basis (books, street posters, the view from my window and anything else I happen to come into contact with). 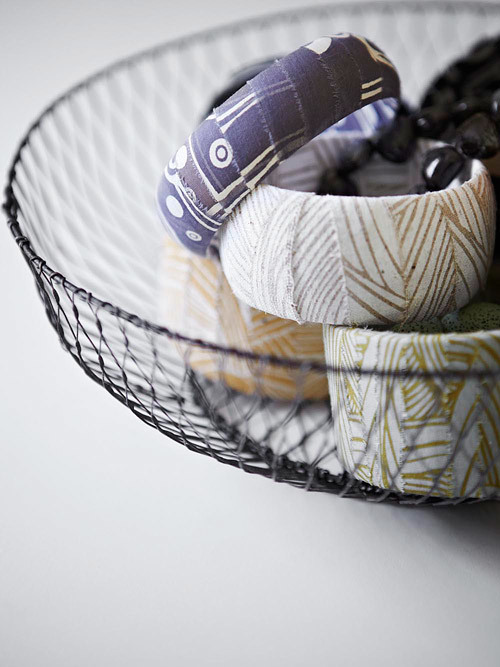 I have however always also really admired traditional Japanese pattern, geometric patterning and geometry in nature. I am also greatly inspired by colour, and find it to be another strong inspiration in my work. In another way (conceptual rather than the purely visual) Indigenous art and design from around the world is another source of inspiration for me – both traditional and contemporary; and understanding the ways in which different cultures convey a message and create symbolism through motif, colour, line and pattern. Crow & Seagull/Dhinawan/Guduu-Bidi tea towels. In what way do you hope your work may inspire or have a positive impact on others and the wider community? If my designs can provide an opportunity for the wider community to connect or interact with Yuwaalaraay or Aboriginal culture (for those who may not have otherwise had that opportunity), then I think that's a great thing, and if the stories behind the prints (or indeed just their visual depictions alone) inspire someone to pass on that story to another then I see that as something truly wonderful. To find out more, visit the Gaawaa Miyay website or follow on Facebook, Pinterest or Instagram @gmiyay. 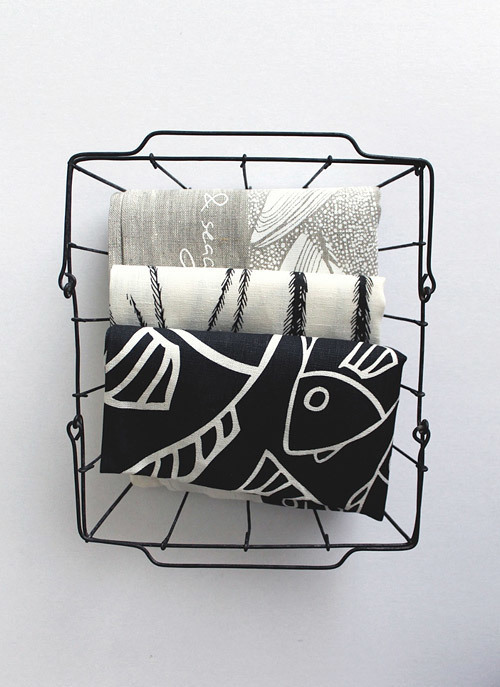 Gawaa Miyay tea towels, scarves, cushions and bangles are available in galleries nationwide. 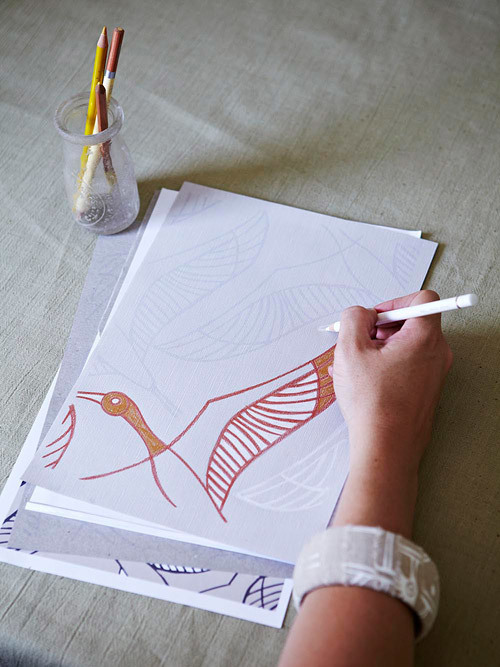 To win a set of Lucy's beautiful Crow & Seagull/Dhinawan/Guduu-Bidi tea towels (pictured above) leave a comment here on the blog before 5pm (AEST) on Friday 13 June 2014. You must be a member of Temple & Webster to enter, and you may only enter once. We will choose our favourite comment, and will notify the winner via their Facebook page or at the email address attached to their Temple & Webster account (if we are able to ascertain it) by Friday 20 June 2014. If we are unable to make contact with the winner via either of those methods within 30 days, we'll choose a replacement winner. Best of luck!